In crafting the first of a potentially infinite number of offshooting side-stories, director Gareth Edwards has quite the mountain to overcome with Rogue One. An undertaking that would never be one of THE Star Wars films, but A Star Wars film. A slice of cinema that would need to feel canonically essential while maintaining a stance all its own. That’s quite a few filmic plates to keep spinning all at once, and the end result is a satisfying yet messy experience that brings plenty of new to a well-worn stage of spectacle and splendour. Slipping into place just before the events of A New Hope, Rogue One attempts to do something Star Wars has never properly entertained before - a war story. Ironically, despite having the operative word in its iconic titles, the sci-fi saga has often left it to the role of novels and video games to recreate the entrenched human cost of conflict. 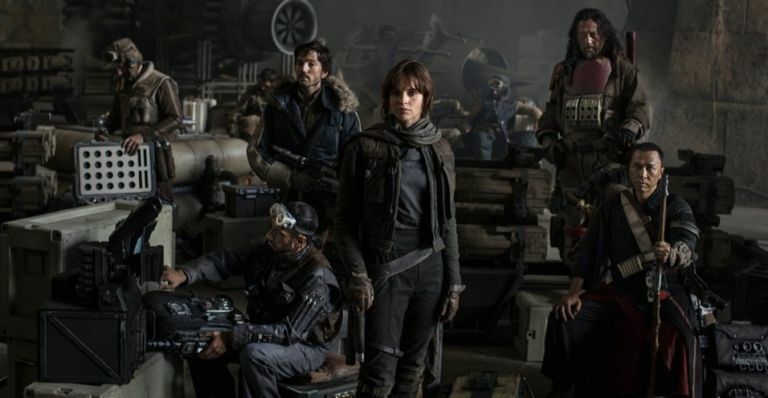 Following a rag tag bunch of rebels, rogues and rapscallions, Rogue One is at its best when it embraces the grittiness of its battles - Rebel forces being mercilessly outmatched by an Empire at its height, battlefields full of small sacrifices and moments of courage. Telling the story of how the Rebel Alliance learned of the Death Star’s secretive existence and just how much it would sacrifice to steal the plans that kick off the original Star Wars nearly four decades ago could feel like well-trodden ground, but Edwards and co manage to create something that feels new and exciting. The fact the human drama of its story is never lost amid Independence Day-style action sequences is a testament to Edwards’ ability to balance the grand with the subtle, creating internal conflicts that rage just as fiercely as the firefights around them. George Lucas’ ill-conceived prequels still linger in the mind, but Rogue One avoids most of the pitfalls that befell the early years of Mannequin Skywalker by tapping into the aesthetic and thematic qualities that makes Star Wars so great. Greig Fraser’s cinematography in particular captures the retro, ’70s feel of A New Hope, crafting something that feels authentic without choking to death on CGI. It’s ensemble cast aren’t your usual princesses and chosen ones, either - they’re a wonderfully flawed bunch of cowards, hot heads, dreamers and killers. Diego Luna’s embittered Cassian Andor is a real highlight, presenting the true face of the Alliance, one changed by the necessary acts of war. His understated performance drives the undercurrent of a Rebellion struggling to survive, adding a new dimension the saga has struggled to articulate on the silver screen. Felicity Jones’ Jyn Erso is our main heroine of sorts, and while she puts in a spirited performance (her scenes with the ever reliable Mads Mikkelsen are easily her best), she doesn’t possess the emboldened spirit of Carrie Fisher or the beating heart of Daisy Ridley, and often disappears in the face of scene stealing performance from her fellow cast. Ben Mendelsohn's deliciously vile Commander Orson Krennic, the white clad overseer of the newly constructed Death Star, is one such attention thief and he manages to bring to life a villain that’s both menacing and fallible (quite the achievement considering the long shadow cast by Vader in this film). Then there’s the brilliant duo of Jiang Wen’s grizzled Baze Malbus and Donnie Yen’s blind monk Chirrut Îmwe. The two bring a unique dynamic to Erso and her fellow rogues, with Yen’s affable charm and lightning quick martial arts talent finally getting the Western exposure he deserves. Rogue One isn’t without its problems, though. The first act suffers in much the same way Suicide Squad did earlier in the year, its narrative flitting between characters and locations at such a pace the story often feels reveals too much of its artifice in the first hour. You desperately want more time with the likes of Îmwe or Alan Tudyk’s K-2SO’s sarcastic former Imperial droid, but the film simply doesn’t have the time as it frantically sets up all the pieces that lead into A New Hope. That fan service that works so well with cameos, references and clever nods in the background also falls a little short when it comes to the return of two familiar characters. The CGI used to recreate them works from some angles, but it too often tumbles painfully into the uncanny valley. Rogue One also overplays its hand with Vader, offering one scene that proves to be nothing more than canon-massaging filler - a sequence that manages to take the edge off another that finally captures just how terrifying the Dark Lord of the Sith truly is in full battle mode. Still, while it may stumble in places, Rogue One strides into the Star Wars saga with confidence, proving the most recognisable sci-fi universe ever conceived can do prequels without sacrificing its own integrity.